Russell Houston appeared on Show 265, recorded in January 2013, at age 19. He, also, appeared on Show 242, recorded in October 2011, at age 17. 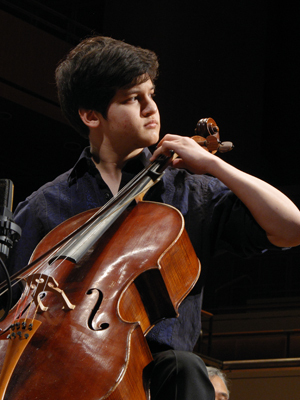 Russell Houston (cello), 19, is from Richardson, Texas. Russell has been playing the cello since age 10. He is currently a freshman at Northwestern University, where he studies under Hans Jorgen Jensen. Russell is the first cellist to win the 2012 Lynn Harrell Concerto. Russell has played for renowned artists such as Timothy Eddy, Paul Katz, Donald McInnes, Johannes Moser, Daniel Mller-Schott, and Janos Starker. On the broadcast, Russell performs Schelomo by Ernest Bloch.